Jill loves being outdoors, whether it’s spending time with chimpanzees in the field or hiking near home. She also enjoys traveling traveling to tropical places, reading books, and spend time with her three dogs. 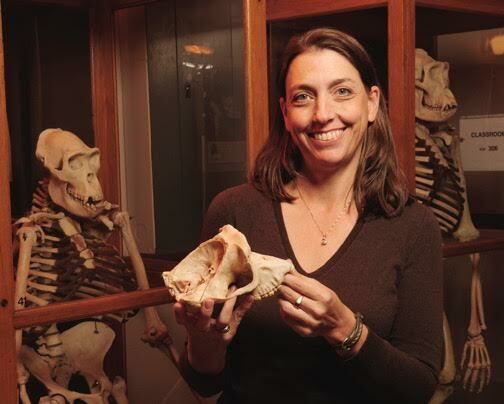 Jill is an anthropologist who studies chimpanzees as a model system to understand behaviors in species that are related to us that existed millions of years ago. From an early age, Jill had a strong love of animals. She would pour over her encyclopedia about animals, and she was particularly fascinated by horses and spider monkeys. However, Jill wasn’t familiar with many career options that would allow her to incorporate her passion. In college, she began to learn more about careers in science, and she was drawn to anthropology and primatology. Taking a field course in college provided her with valuable experience that helped her to secure future positions. Perseverance has been a key for Jill. Trying to habituate chimpanzees (get them used to the presence of the research team) and get funding for habituation has been a challenge. Before the habituation can begin, the research team also faces the difficult task of finding the chimpanzees. This can be quite a struggle sometimes, and the field conditions in Senegal can be brutal. It gets really hot in the summer, there are limited medical resources, and Jill gets sick with malaria nearly every year. Fortunately, being able to study the chimpanzees in the wild makes it all worth it! One of the most exciting reports that came from Jill’s group’s research described how the chimpanzees in Senegal use tools to hunt, and the females engaged in this behavior more than males. They have also documented other unusual behaviors in chimps such as escaping the heat by soaking in water. This summer, Jill was able to travel to East Africa as a speaker for National Geographic Expeditions tours. In Uganda, she stayed in a place called Bwindi Lodge adjacent to the Bwindi National Park. While birdwatching, Jill stumbled across a few mountain gorillas in their natural habitat, and it was an unforgettable experience. After returning from a long day in the field in Senegal, the research team tends recount the behaviors of the chimpanzees, such as unexpected displays of dominance or agression, like they would the happenings of a soap opera. It’s a hard balance between anthropomorphizing too much and making sure not to under-appreciate the significance of a chimpanzee’s behavior. The researchers also have a lot of fun picking names for the chimpanzees. Follow your passion and persevere, even if it seems impossible. Also, as you go through life, it may seem like everyone is smarter than you, but they’re not. Keep this in mind when you feel insecure. As a primatologist, Jill has studied the behavior of non-human primates such as chimpanzees, spider monkeys, howling monkeys, tamarins, patas monkeys, and vervets in various locales. Countries in which she has conducted fieldwork include Peru, Costa Rica, Nicaragua, Kenya, and Senegal. Jill is especially interested in the influence of ecology on primate and early human feeding, ranging, and social behavior. She currently has a research project in southeastern Senegal which has been funded by National Geographic Society and the National Science Foundation. The goal of this ongoing project is study or conduct research on chimps in a habitat similar to that of early hominids. Jill is also involved in teaching and conservation in the Neotropics. She is the co-founder of the non-profit organization DANTA, which is affiliated with the El Zota Biological Field Station in Costa Rica where she taught field courses on primate behavior and ecology. She has taught similar courses in Nicaragua, Panama, and other locales in Costa Rica.